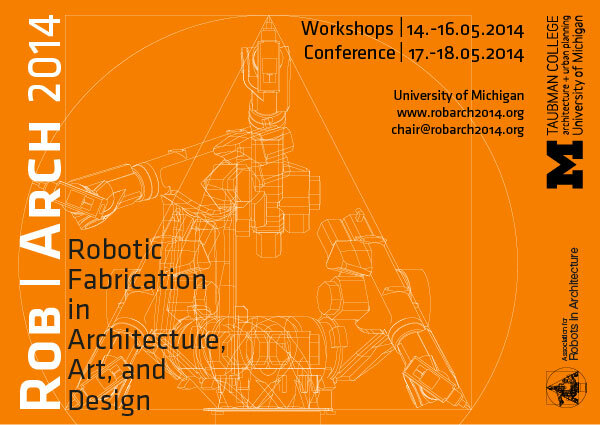 The organizing committee of the Rob|Arch 2014 conference and the Association for Robots in Architecture are inviting the community to submit workshop proposals for the upcoming Rob|Arch 2014 conference (May 14th to 18th, 2014). A total budget of 15.000USD is available to financially support the workshops. One of the defining elements of Rob|Arch 2012 were the eight robot workshops that were offered all over Europe. European universities not only organized their own workshops, but also hosted teams from the American universities Harvard and SciArc. For Rob|Arch 2014, the host universities of Michigan and Carnegie Mellon have additional robot capacities for external workshops. We are encouraging workshop proposals until 15.6.2013. See call.robarch2014.org for more details. In other news, there are several robot workshops and lectures upcoming: Robots in Architecture will hold a lecture at the “BIM for Life Cycle Structures” symposium in Vienna (June 13th to 14th), alongside other presenters such as Tobias Schwinn (from ICD Uni Stuttgart – refer to their great robotic research pavilions), Christian Derix from AEDAS, Baris Cokcan of 2Architects-Int, Martin Tamke of CITA, and Stephan Laub of LaubLab/VrayforC4D. Registration is free for students. Later in June (27th to 28th) the 7th National Symposium on Digital Design takes place in Istanbul/Turkey, with a robot workshop that is offered in cooperation with KUKA Turkey and ITU. Soon thereafter, from July 3rd to 5th, we are doing a two-day robot workshop in Shanghai as part of the upcoming CAAD Futures 2013 conference.